Every cell phone does have a clock. But not every phone has a world clock like your iPhone’s Clock app, which lets you display the time in multiple cities on multiple continents. And not every cell phone has an alarm, a stopwatch, and a timer to boot. Take a moment in time to look at the time functions on your iPhone. Want to know the time in Beijing or Bogota? 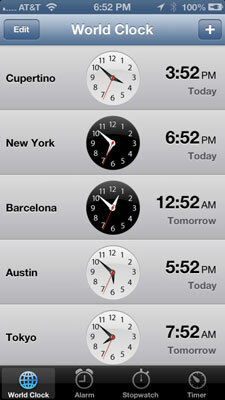 Tapping World Clock (inside the Clock app) lets you display the time in numerous cities around the globe. When the clock face is dark, it’s dark in the city you chose; if the face is white, it’s light outside. Tap the + button in the upper-right corner of the screen and use the virtual keyboard to start typing a city name. 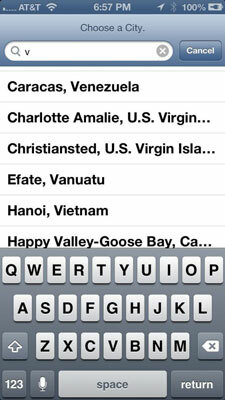 The moment you press the first letter, the iPhone displays a list of cities or countries that begin with that letter. So, typing v brings up both Caracas, Venezuela, and Hanoi, Vietnam, among myriad other possibilities. You can create clocks for as many cities as you like, though on a single screen you can see the time in only four cities on an iPhone 4 and 4S and five cities on an iPhone 5. To see times in other cities, scroll up or down. To remove a city from the list, tap Edit and then tap the red circle with the white horizontal line that appears to the left of the city you want to drop. Then tap Delete. You can also rearrange the order of the cities displaying the time. Tap Edit, and then press your finger against the symbol with three horizontal lines to the right of the city you want to move up or down in the list. Then drag the city to its new spot. Tap Clock on the Home screen to display the Clock app. Tap the + button in the upper-right corner of the screen. Choose the time of the alarm by rotating the wheel in the bottom half of the screen. This step is similar to the action required to set the time that an event starts or ends on your calendar. If you want the alarm to go off on other days, tap Repeat and then tell the iPhone the days you want the alarm to be repeated, as in Every Monday, Every Tuesday, Every Wednesday, and so on. Tap Sound to choose the ringtone to use to wake you up. You can even use a custom ringtone you created or choose a song from your Music library. Tap Snooze to display a Snooze button along with the alarm. Tap the Snooze button to shut down the alarm for nine minutes. If you want to call the alarm something other than, um, Alarm, tap the Label field and use the virtual keyboard to type another descriptor. Simple stuff, really. But if you want really simple and have an iPhone 4S or 5, you can ask Siri to set the alarm for you. You know that an alarm has been set and activated because of the tiny status icon (surprise, surprise — it looks like a clock) that appears in the upper-right corner of the screen. An alarm takes precedence over any tracks you’re listening to on your iPhone in Music. Songs momentarily pause when an alarm goes off and resume when you turn off the alarm (or press the Snooze button). When your ring/silent switch is set to Silent, your iPhone doesn’t ring, play alert effects, or make iPod sounds. But it will play alarms from the Clock app. That’s good to know when you set your phone to Silent at a movie or the opera. And, although it seems obvious, if you want to hear an alarm, you have to make sure that the iPhone volume is turned up. If you’ve set an alarm, it takes precedent over the Do Not Disturb feature. Not all phone carriers support the network time option in all locations, so an alarm may not sound at the correct time in a given area. If you’re helping a loved one train for a marathon, the iPhone Stopwatch function can provide an assist. Open it by tapping Stopwatch in the Clock app. Just tap Start to begin the count, and then tap Stop at the finish line. You can also tap a Lap button to monitor the times of individual laps. Cooking a hard-boiled egg or Thanksgiving turkey? Again, the iPhone comes to the rescue. Tap Timer (in the Clock app) and then rotate the hour and minute wheels until the time you have in mind is highlighted. Tap When Timer Ends to choose the ringtone that will signify time’s up. After you set up the length of the timer, tap Start when you’re ready to begin. You can watch the minutes and seconds wind down on the screen, if you have nothing better to do. If you’re doing anything else on the iPhone — admiring photos, say — you hear the ringtone and see a Timer Done message on the screen at the appropriate moment. Tap OK to silence the ringtone. You can set a sleep timer in the iPhone to shut down music or video after you’ve shut down. Set the amount of time that you think you’ll want the iPhone to be spitting out sound, and tap When Time Ends. Then tap Stop Playing. The iPhone will be silenced when the time you’ve set has been exhausted.